Develop your ability to hear individual notes heard in succession. 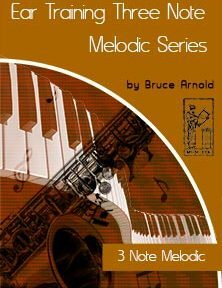 The Ear Training Three Note Melodic< is recommended for students with above 80% skills with one note ear training and have completed the Ear Training Two Note Melodic Series. Ear Training Three Note Melodic consists of three levels of Ear Training Three Note Melodic using a major key center and three levels of Ear Training Three Note Melodic using a minor key center. You can also buy both as a bundle. Get Ear Training Three Note Melodic Bundle with Both Major and Minor Keys All Levels download today! Click on a title to go directly to the book. Having around 80% right notes with the “one note” exercise found in these books would help you be more productive with the Ear Training Three Note Melodic. Having Troubles with Ear Training Three Note Melodic? The Ear Training Three Note Melodic Major Key is divided up into three levels: Beginning, Intermediate and Advanced. It is recommended that you first complete the 2 Note Instrumental Series before attempting the 3 Note Melodic downloads. All of these downloads are recommended if you are getting 80% correct using the Advanced examples from the Ear Training One Note Complete Book. The Three Note Melodic exercise contains a major cadence on piano followed by three consecutive pitches played by a piano. Then after a pause you will hear the note names of the three notes. As you move from Beginning to Intermediate to Advanced the level gets progressively more difficult, you will be asked to recognize and respond as both the cadence and the three notes are played more quickly. Hear notes in relation to the “key center” not their relationship to each other. Each level of the Ear Training Three Note Melodic Series plays one of the melodic possibilities within two octaves both ascending and descending. This is of course creates a very large number of combinations and therefore these downloads are very large. Each level of the Ear Training Three Note Melodic Major Key plays one of the melodic possibilities within two octaves both ascending and descending. This is of course creates a very large number of combinations and therefore these downloads are very large. 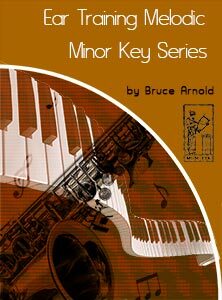 These Ear Training Three Note Melodic Major Key downloads do not contain a book. You should work first work with the Ear Training One Note Complete Book so that you can fully understand this ear training method before attempting the Three Note Series. You will use the same technique as you did with the Ear Training One Note as you identify the sound of each pitch within the key center. Get Ear Training Three Note Melodic Major Key Beginning Level download today! The Intermediate level is about twice as fast as the Beginning Level. Please check the examples below to see if this download is appropriate. Please note this is a 1 Gigabyte download. You would be best to download at night or other times when internet traffic is lighter in your area. We would also recommend not using the internet after the download has started. If you experience problems please contact us before you attempt multiple downloads. Get Ear Training Three Note Melodic Major Key Intermediate Level download today! The Advanced Level is extremely fast. It is assumed that you have the ability to quickly hear a key center and have the music theory skills to answer quickly. Get Ear Training Three Note Melodic Major Key Advanced Level download today! The Ear Training Three Note Melodic Minor Key is divided up into three levels: Beginning, Intermediate and Advanced. It is recommended that you first complete the Ear Training Three Note Melodic Major Key Series before attempting the Ear Training Three Note Melodic Minor Key downloads. The Ear Training Three Note Melodic Minor Key exercise contains a Minor cadence on piano followed by three consecutive pitches played by a piano. Then after a pause you will hear the note names of the three notes. As you move from Beginning to Intermediate to Advanced the level gets progressively more difficult, you will be asked to recognize and respond as both the cadence and the three notes are played more quickly. Each level of the Ear Training Three Note Melodic Minor Key plays one of the melodic possibilities within two octaves both ascending and descending. This is of course creates a very large number of combinations and therefore these downloads are very large. These Ear Training Three Note Melodic Minor Key downloads do not contain a book. You should work first work with the Ear Training One Note Complete Book so that you can fully understand this ear training method before attempting the Three Note Series. You will use the same technique as you did with the Ear Training One Note as you identify the sound of each pitch within the key center. Get Ear Training Three Note Melodic Minor Key Beginning Level download today! Get Ear Training Three Note Melodic Minor Key Intermediate Level download today! Get Ear Training Three Note Melodic Minor Key Advanced Level download today! Special Price Till Tuesday, August 28th! This entry was posted in Ear Training by Muse Eek. Bookmark the permalink.